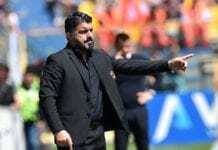 Gennaro Gattuso is seeking an improved performance from Milan in their Champions League tussle with Lazio in Serie A on Saturday. The Rossoneri are on a four-game winless run- Three defeats and no wins leaving them just a point above Lazio in fourth place. And just before the encounter, Rino has urged his men to step up their game against Lazio in order to please the San Siro fans. “Getting the fans back on side tomorrow is a must,” Gattuso said at a Press conference via Football Italia. “San Siro has pulled in incredible numbers. We must be able to make them happy. “The fact that there will be 60,000 must be a responsibility for us to get them fired up with a good performance and a great mentality. Gattuso also described Inzaghi’s men as tactically astute like Serie A leaders Juve demanding consistency in the game. “Lazio look a lot like Juve, they fill the box and have physicality. We’ll need to be ruthless, strong and have the desire, but while trying to play football in the best possible way. “However we’ve always struggled against them, so we’ll have to give as good as we’ve got. “I’d like to see the same performance we offered against Juventus, but while making fewer mistakes, believing in what we do and playing with mentality and desire. “It’s necessary to play with consistency. This is a crucial match for the table. Against Lazio, we have to play to win.